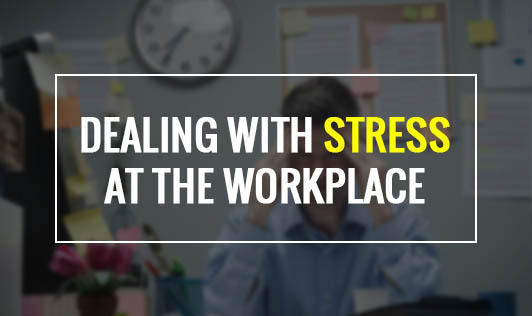 Dealing with Stress at the Workplace. Increased stress in the workplace can have a negative effect on many people. While lower productivity and efficiency will reduce output, in general, greater stress might trigger an increased absence due to sickness. In turn, this could raise workloads for others and cause lower motivation and reduced quality. It is important that if you recognise signs of stress at work, you can find ways to respond. There will be a range of options available depending on your organisation, levels of hierarchy and capacity for change. The first stage is to be able to identify signs of stress in colleagues and teams. Once you have understood what the symptoms are you will be in a better position to know what action you need to take. Common symptoms of stress include (but are NOT limited to): Frequent headaches, jaw clenching or pain, Neck ache, back pain, muscle spasms, Reduced work efficiency , lack of energy or tiredness, Presenteeism . While you may be able to make immediate changes, it may be important to make someone in authority aware of your observations. They may have a responsibility for you and your team and would find it important to know to take corrective action. Your doctor is responsible for your physical and mental health, so should always be considered as a source of support. They may be able to refer you to specialised services or provide you with appropriate short-term medication. Counselors provide a safe and supportive environment where you can talk to someone outside of your home or work. Talking to a qualified professional can help you identify the sources of problems and explore what you can do to change the situation. If you are unsure of how to deal with stress at work, contact a counselor at Truworth Wellness. They will help you clarify the issues you have identified and explore the options that are available to you.